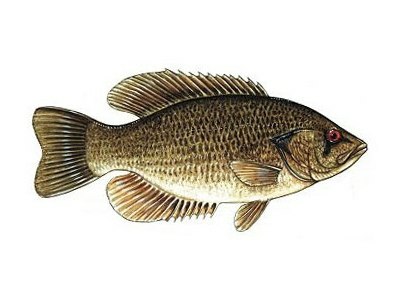 Rock bass are sturdy built medium sized members of the sunfish family. They are brownish in color with several dark bars or blotches mottling their sides. Rock bass typically reach six to ten inches in length. Rock bass are named for their tendency to lurk around underwater rocks, stones and boulder rubble. The species is found in warmwater lakes, reservoirs and especially in streams and rivers with rocky pools. Rock bass are bottom-feeders, feeding on aquatic insects, crayfish and small fishes. They are often associated with smallmouth bass and readily take baits, lures and flies that are fished for smallmouths. Other names for the species include red-eye and goggle-eye, in reference to their bright red eyes.